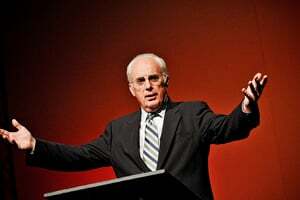 John MacArthur brought a second message this evening. This one was entitled Does the Doctrine of the Divine Decrees Eliminate Human Will? He took us through several passages (Isaiah 10, John 3, Acts 1-2, and Romans 9-11) which richly display that the Bible teaches the compatibility (or the concurrence) of God’s sovereignty and human will. In addition, we must embrace evangelical duty: Our obligation to present Christ to everyone. This is the big hurdle to get over for those who are new to Reformed theology.But it also remains a big dilemma for those who are familiar with Reformed theology. There are no short answers to it. The issue just doesn’t go away. Dr. MacArthur chose to address this issue with us in the form of a Bible study. How can woe be upon Assyria, when the nation (simultaneously) is the rod of God’s anger? Israel is now called a “godless nation” (verse 6). God is sovereign: He grabs Assyria and says “you will be my instrument of fury against a godless people who have rejected me.” Yet Assyria has absolutely no clue; they have no plan or desire to act as the agent of Jehovah (verse 7). Rather, it purposes to cut off many nations. In other words, for them, this is just another opportunity to grab more power by beating up on a neighbor (see verses 7-11). And then, God plans to turn on Assyria. He will punish them for their acts and for their motives: “I will punish the fruit of the arrogant heart of the king of Assyria and the pomp of his haughtiness. For he has said, ‘By the power of my hand and by my wisdom I did this’” (verses 12-13). Some explanation is provided by God in verse 15: “Is the axe to boast itself over the one who chops with it?” God is wielding Assyria like an ax. In this passage, we see the concurrence of divine sovereignty and human will negatively: God will hold every person accountable for every evil act they commit, and God is sovereign over those acts. Jesus knew what Nicodemus was thinking (see John 2:23-25), so he answers Nicodemus’ real question: “Truly, truly, I say to you, unless one is born again he cannot see the kingdom of God” (John 3:3). Jesus’ point is that just as you could not create your own physical birth, so are you unable, Nicodemus, of producing spiritual life. Flesh can only produce flesh. We are absolutely dependent on a spiritual work of God. Nicodemus wants to know how he can affect this new birth: “How can a man be born when he is old? He cannot enter a second time into his mother’s womb and be born, can he?” (John 3:4). Jesus’ point is that this is a miracle; there is no way Nicodemus can do it. This is pure divine sovereignty. Jump down to John 3:27, “A man can receive nothing unless it has been given him from heaven.” You must plead for God to give you life. Yet, there is a human being commanded to believe. Those who believe escape judgment. Others are under judgment (John 3:15-18). Verse 37: “All that the Father gives Me will come to Me, and the one who comes to Me I will certainly not cast out.” Then 39-40: “This is the will of Him who sent Me, that of all that He has given Me I lose nothing, but raise it up on the last day. For this is the will of My Father, that everyone who beholds the Son and believes in Him will have eternal life, and I Myself will raise him up on the last day.” Well, who is raised up on the last day? All those whom God the Father gave to God the Son AND all those who believed in Jesus. Divine sovereignty and human will. The prophecy of a betrayer for Jesus was fulfilled in Judas. But Judas “went to his own place” (Acts 1:25). Paul is vexed by the observation that the Israelites, as a people, had a rejected the Messiah. But in verse 6 he notes, “But it is not as though the word of God has failed. For not all who are descended from Israel belong to Israel.” In other words, it never was the intention of God to save every single Jew. Isaac was chosen, but not Ishmael. Jacob was chosen, and not Esau. God has as much right to display His wrath as to display His mercy. Pharaoh was raised up as an instrument of wrath (Rom. 9:22). The Gentiles were not pursuing God, and the Jews were pursuing it the wrong way (through works instead of through faith). What’s wrong with Israel? They rejected Christ - they had a zeal for God, but not according to knowledge (Rom. 10:2). They had made a god that was not a true God. They thought God was less holy than He really is and they thought they were more holy than they really are. In reality, the gulf between us and God is infinite - impassible. They needed an alien righteousness. They didn’t understand that they needed an imputed righteousness. They didn’t understand that righteousness is based on faith. They thought they were capable of living with enough righteousness to merit salvation. But the only way for sinners to be saved is to believe. God does not owe us a full explanation, and we’re not fully capable of understanding it anyway. We are left with doxology: “For from Him and through Him and to Him are all things To Him be the glory forever. Amen” (Rom. 11:36).